I'm so excited for fall, but I wanted to get in one more bright and fun summer color before I switch over to my more neutral and autumn-inspired shades. This mini-bottle in the color Jealous from Sephora's line is the perfect little pop of color to say farewell to summer. 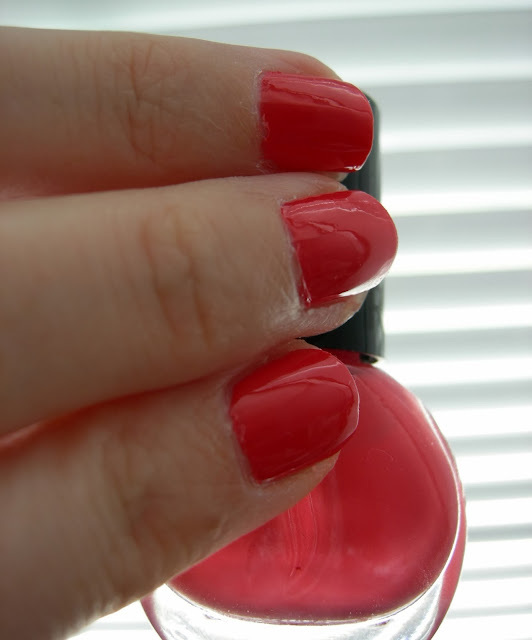 The deep pink coral shade took two coats to achieve this look. The first coat was almost enough but wasn't as opaque as I like. The color has a very smooth application. The most amazing thing about this mini bottle is the size of the brush. It has a full brush that reminds me of the Sally Hansen Complete Salon Manicure brushes. It makes applying the polish quick and easy.